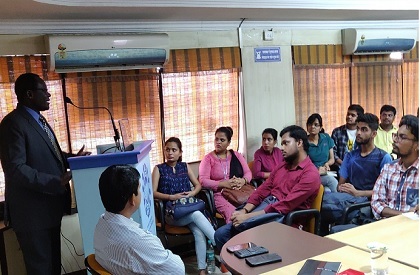 BHOPAL: Child rights are entitlements every child should have and all children have same rights, Michael Juma, Chief, UNICEF Madhya Pradesh said while speaking to students of Makhalal Chaturvedi National University of Journalism and Mass Communications on Friday. Speaking at a programme on the campus of University, Juma further said that proactive involvement of institutions of higher learning and media is critical in addressing all forms of violations of child rights, particularly child marriages. This was part of special lecture on the theme of child rights and media. Deepak Tiwari, Vice Chancellor of the University welcomed Michael Juma and said that it is important for students to learn about the work being done by UNICEF and how it brings focus on strengthening systems for women and children. Students interacted with the UNICEF chief and asked questions on work being done by UNICEF, what more efforts are needed to control violence against children and how they can associate with UNICEF. Anil Gulati, Communication Specialist, UNICEF, Madhya Pradesh and Sujan Sarkar, Planning Officer UNICEF, Deependra Bhagel, Registrar, Pavitra Srivastava, Dean Academics and Dr Kanchan Bhatia of the University were present at the lecture along with students of journalism, media and mass communications. This programme was part of work being done to engage young people in initiative to mark 30 years of Convention of the Child Rights.